Please apply for this tag by contacting the Sponsor organization at the link above and submitting the $25 manufacturing fee to the organization. 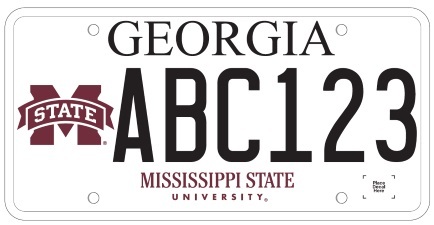 You may then take your receipt to your local county Tag Office to order your Mississippi State University sponsor tag. You will receive a Temporary Operating Permit to drive on and your tag will be mailed to you. Please make sure your current address is updated at your county Tag Office.